AGUA DULCE – A fire that broke out early Monday afternoon in the Agua Dulce area quickly scorched about 1,400 acres of brush, prompting evacuations and road closures and causing a minor injury to one firefighter. Dubbed the “Stone Fire,” the blaze was reported around 12:30 p.m. Monday, June 4, near the 35100 block of Anthony Road and went to a third alarm by 1 p.m., according to the Los Angeles County Fire Department. By early Monday evening, the fire had scorched about 1,400 acres and was 30 percent contained, though evacuations that had affected nine homes were lifted, a fire department inspector said. The injured firefighter was taken to a hospital, officials said. No other injuries were reported and no structures were damaged. There was no word on what sparked the flames. Mandatory evacuations had been in effect for Anthony, Hierba and Bass Rock roads, as well as Beauty Vista Lanes, all north of Sierra Highway and Anthony Road was closed north of Sierra Highway, but all evacuations were lifted about 8 p.m. according to the Los Angeles County Sheriff’s Department. A soft closure remained in effect on Anthony Road north of Sierra Highway, but all other area roads were reopened, officials said..
About 350 personnel were on scene at one point, and several helicopters and a fixed-wing aircraft, including four air tankers, were deployed. The flames were burning in medium brush in the sparsely populated, rural area. 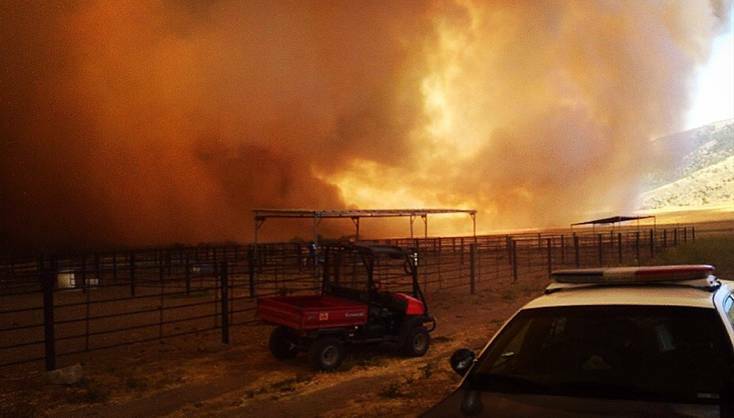 Animal control officials were dispatched to the area to assist with evacuations of horses and other animals. The county Department of Animal Care and Control advised that horses and other large animals could be brought to the Antelope Valley Fairgrounds at West Avenue H in Lancaster and dogs, cats and other small pets to the Castaic Animal Care Center at 31044 N. Charlie Canyon Road or the Palmdale Animal Care Center at 38550 Sierra Highway. According to the National Weather Service, temperatures were cooling as evening approached. By about 9 p.m., it was 75 degrees in nearby Acton with relative humidity of 46 percent, and west winds that had been gusting near 20 mph had dropped to single digits. Soon after the fire broke out, the temperature was closer to 100 degrees with relative humidity of 11 percent. 1 comment for "Fire near Agua Dulce burns 1,400 acres; evacuations lifted"